Welcome to Yarwoods Excavator Attachments Ltd, specialists in the Rental, Sales, Service and Repairs of all excavator mounted attachments. 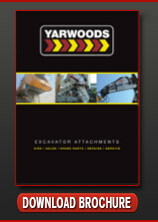 With over 40 years of experience, Yarwoods truly are specialists in excavator attachments, whether for Hire or Sale, we have the expertise and experience to supply your business with the industry leading, highest performing yet cost effective quality products that are built to both perform and stand the test of time. We are the only authorised UK importer of TOKU Hydraulic Hammers and HARTL Crusher Buckets and Screener Buckets. Additionally, Yarwoods together with KINSHOFER and Demarec, (the German and Dutch manufacturers of specialist attachments for the Construction, Demolition, Recycling, Scrap and Railway Industries), have signed an exclusive supplier dealership to cover all of Scotland and the North East of England down to Derbyshire. Our selection of quality attachments includes: Hydraulic Hammers, Multi Quick Processors, Pulverisors, Dedicated Shears, Selector and Demolition Grabs, Timber Grabs, Clamshell Buckets, Compaction Plates, Riddle Buckets, Ripper Tooth, Rakes, Pallet Forks, Magnets, Crusher Buckets, Pile Croppers and more. Yarwoods supply equipment for hire or sale through the UK including Scotland, England, Ireland and Wales. With our strategically located depots, we serve the North West, North East, Yorkshire, Midlands and the UK as a whole, including Glasgow, Edinburgh, Lanarkshire, Inverness, Carlisle, North West, Newcastle Leeds, Bradford, York, Sheffield, Birmingham and beyond. 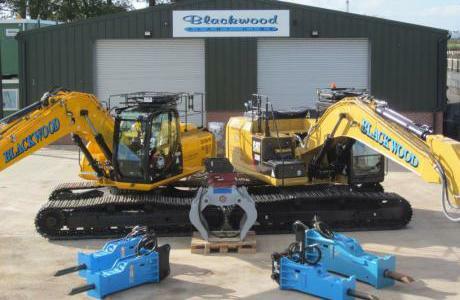 BLACKWOOD Plant Hire has completed a new deal with Yarwoods for a number of top of the range products including TOKU Breakers and a Demarec Selector Grab. Owner Tom Blackwood bought his first TOKU breakers from Yarwoods back in 2003 and these breakers are still running today. Indeed, the Blackwood breaker fleet is now 100% Toku. Blackwood's Paul McCormack said, "You can send a TOKU breaker out to work in total confidence. At first glance the TOKU breakers look much the same as other breakers - it's when a few years down the line you check the costs and the age you realise how good they are." Yarwoods is building a loyal TOKU customer base throughout the UK. Director Peter Yarwood added, "Customers are becoming very impressed with the performance of the TOKU brand and Yarwoods is committed to this first class product and excellent back up service."